The task of home furnishing in the English cottage or country style is made much simpler if we have some time tested ideas to guide us, and these tips, from a noted authority on house furnishing and home interior decoration styles and history, are of perennial interest and usefulness. New styles may grow up as time passes, new modes and methods ; although nothing is really fresh and new that is produced by craftsmen who have the example of past fashions to guide them. The only way for a new style to be founded, something fresh and uninfluenced by historical suggestions, would be for some country to lose its civilisation and relapse into barbarism. It would endure a period of Dark Ages, and then rise gradually, in the manner of the various European states after the collapse of the Imperial Roman system, and it would evolve its own architecture and decoration and art without reference to or knowledge of anything that had been done before by other peoples. Design would be fostered by construction; ornament would appear naturally; there would be no hampering traditions. The builders and craftsmen would devise their own embellishments, intricate or simple according to their skill. Today we develop what has been achieved in the past, and the discarding of clumsy models and dull designs may in time create a period in which good taste in interior decorating will be too firmly established to be influenced by bad experiments. To eliminate bad ornament and decor at all times and in all places is a definite duty as well as an ideal. Ugliness is unnecessary, and this we attempt to show how it may be avoided in the furnishing and arrangement of our homes. 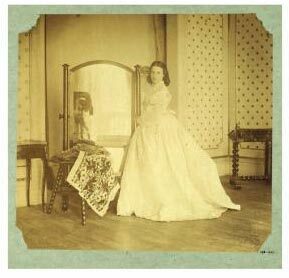 A woman poses beside a mirror. A movable screen has been placed behind it, across the opening into the next room. A side table at the left balances a desk at the right. Sofa Cushions & Cushion Covers.